On the eve of the 90th anniversary of the glorious 1917 Bolshevik Revolution, the Communist Party of the Russian Federation has just held its XII (Extraordinary) Congress. An optimistic affair, the party is enjoying a boost in membership and and is ready to capitalise in next year's Duma and presidential elections on a swing to the left by Russian voters. The CPRF can confidently expect its best electoral showing since the "fall of communism" in 1991. From the CPRF website-translated by Babelfish with refinements from Once Upon a Time in the West. The chairman of the Central Committee of the Communist Party of the Russian Federation G.A. Zyuganov opened the congress... 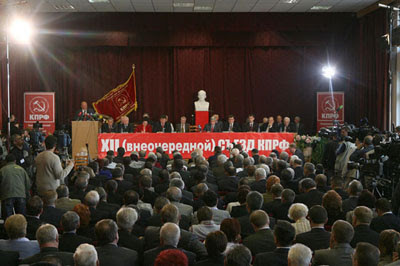 Among those invited were veterans of the party, delegations from the other parties belonging to the Union of Communist Parties-Communist Party of the Soviet Union, party and youth activists, representatives of the diplomatic corp...Deputies of the State Duma and the members of Federation Council, and scientific and cultural workers. In the hall were invited the representatives of the student forces of the CPRF, active membership of the Komsomol, and young Communists who recently entered the party. The first secretary of the Central Committee of the CPRF Komsomol Y.V. Afonin read a report about the summary of the work of the student forces of the CPRF. The chairman of the CPRF CC G.A. Zyuganov entrusted to the most outstanding Komsomol members the medal of the CPRF CC in the honor of the 90th anniversary of the Great October Socialist Revolution. 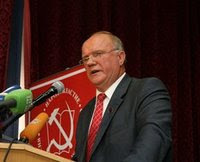 G. A. Zyugamov noted that in recent years the CPRF recruited 70,000 people, a considerable proportion of them young people. 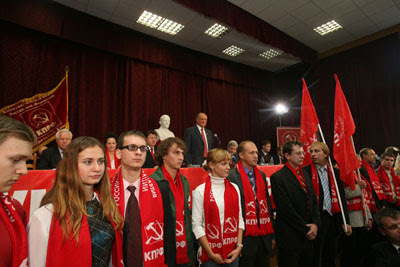 Zyuganov then encouraged the young reinforcements of party.